A Hot Brown Recipe That is Authentic, Easy and Delicious. This Hot Brown Recipe is authentic, easy and most importantly, absolutely delicious. It is also a fantastic way of using leftover chicken or turkey. The Hot Brown open face sandwich originated at The Brown Hotel in downtown Louisville, KY back in 1926 by Chef Fred Schmidt. 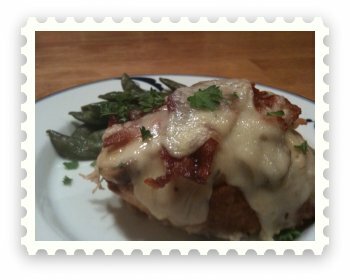 This Hot Brown recipe included french bread, turkey, a cheese sauce, bacon, mushrooms and Swiss cheese. The leftover turkey I used came from my Weber grill, so there is a slight smokiness to the dish. Leftover beer can chicken would work nicely as well. Please watch my video below to get a feel for how to correctly make the sauce and how to assemble the sandwich. Trust me, this is one recipe you will want to use again. It is absolutely fantastic. Do you have a question for Dave about this recipe? CLICK HERE! Cooked Turkey or Chicken: Weber turkey or beer can chicken would be perfect. Approximately 2.5 lbs. Toast the sliced bread and set aside. Thinly slice the chicken or turkey and set aside. Add sliced mushroom and saute of three minutes. Set shallots and mushrooms aside. To Make the Sauce: You should really watch the video, but melt 1/4 stick of butter and mix in 2 tablespoons of butter. Once mixture is smooth, slowly whisk in milk. Add poultry seasoning, cayenne pepper and 1/4 cup of the cheese. This is called a Bechamel Sauce for those of you who are interested. Assemble the Sandwich: Place turkey or chicken on bread. Spoon on mushroom mixture and then the sauce. Then lay bacon on the sandwich and top off with Swiss cheese. Bake at 400 degrees Fahrenheit for five minutes then broil at 400 degrees Fahrenheit for two minutes or until the cheese is melted.